The Ginetta Junior Championship visited Oulton Park on 20th-21st May die rounds 7 and 8. 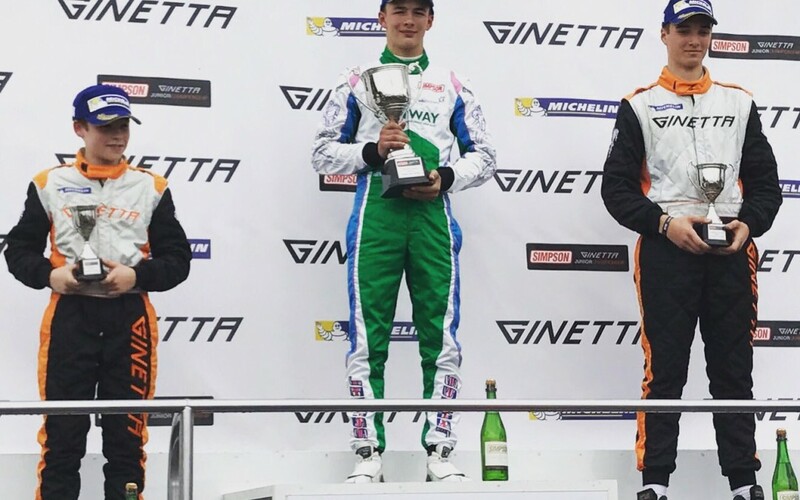 The weekend saw Douglas Motorsport’s Kiern Jewiss come away with two overall podiums, a 3rd and a 2nd, after two close fought battles with Tom Wood. These two podiums meant Jewiss took the 2 rookie wins and the overall lead in the rookie championship. He leads the rookie championship by 48pts. Connor Grady put in another solid performance, which resulted in him finishing 4th in round 8 which was his best result this season. A seventh place finish in round 9 gave Douglas Motorsport 3 finishers in the top 7. Daniel Harper had a tricky weekend with incidents off the start in rounds 8 and round 9. He did enough to bring the Ginetta G40 home in 5th place in race 2 and maintain his second place in the overall championship. Tom Canning sees his 3rd place in the overall rookie cup slip away slightly after he lost out on points over the weekend to Ruben Del Sarte.